In her debut novel, Claire Humphrey shows us a world of magic existing in the shadow of Queen Street bars and down side streets lined with old houses in Toronto. 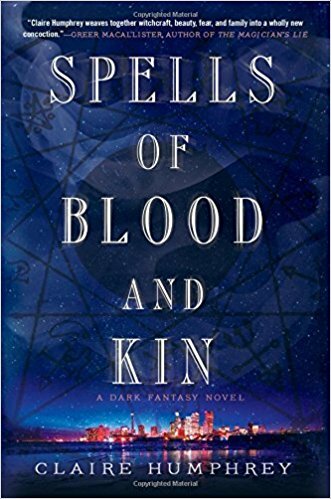 When Lissa Nevsky's grandmother dies, she inherits the old world magical practices and an old obligation that comes trailing a dark history of violence and bitterness. In cool, elegant prose, Humphrey's novel gives us a fresh take on magic, exploring the gifts it can bestow and the price it exacts. Humphrey's use of a real, contemporary Canadian setting and her refusal to allow her characters any easy victories set this novel apart from a field of strong competitors. Claire Humphrey is a national buyer for Indigo Books. Her short fiction has appeared in Strange Horizons, Beneath Ceaseless Skies, Apex, Crossed Genres, Fantasy Magazine, and Podcastle. Her short story "Bleaker Collegiate Presents an All-Female Production of Waiting for Godot" appeared in the Lambda Award-nominated collection Beyond Binary, and her short story "The Witch of Tarup" was published in the critically acclaimed anthology Long Hidden. Sophie Quire and the Last Storyguard (volume two in the Peter Nimble series by Jonathan Auxier) is a surprisingly complex take on age-old themes. Intrepid heroes, vivid villains, and an array of fantasy characters interact in a plot that places the importance of storytelling at its heart. It's a metafictional adventure about the power (and limits) of story that, despite its invocation of well-worn tropes and its echoes of classics of children's fantasy, still manages to be both surprising and gripping (and very funny) in its long, intricately-plotted narrative. It celebrates pure storytelling pleasure and refreshingly avoids any didactic moralizing. Jonathan Auxier is a Canadian-American writer of young adult literature. His debut novel Peter Nimble and his Fantastic Eyes was an ABA New Voices pick and a BookPage Magazine Best Book of 2011. His novel The Night Gardener won the TD Canadian Children's Literature Award and the Canadian Library Association Book of the Year for Children Award, and was shortlisted for the Sunburst Award and the Governor General's Award. The winner of the 2017 Sunburst Award for Short Story is "The Sailing of the Henry Charles Morgan in Six Pieces of Scrimshaw (1841)" by A.C. Wise (initially published in The Dark, Issue 14). In an ingenious twist on the “found manuscript” trope, the narrative develops through pictorial vignettes inscribed on whalebone, baleen, and a rib of mysterious origin, minutely described as if for a museum catalogue or forensic report. Wise's story is eerie, subtle, and highly visual, with pleasurably chilling overtones of Lovecraft’s Innsmouth abominations. Although individual characterization is virtually eliminated by the unique form and the distanced, objective narrative, it still succeeds in frightening and engaging the reader. A.C. Wise was born and raised in Montreal, and currently lives in the Philadelphia area. Her work has appeared in publications such as Clarkesworld, Tor.com, Shimmer, and The Year's Best Dark Fantasy and Horror 2017, among other places, and has been a finalist for the Lambda and the Sunburst Awards. Her collections The Ultra Fabulous Glitter Squadron Saves the World Again and The Kissing Booth Girl and Other Stories are both published by Lethe Press. The 2017 Sunburst Award jury was comprised of Nancy Baker, Michel Basilières, Rebecca Bradley, Dominick Grace, and Sean Moreland. The Sunburst Award Society thanks Kobo Writing Life for providing their jurors with Kobo Aura One tablets in order to read electronic submissions. Submissions will be accepted of works published in 2017 for the 2018 awards beginning in October 2017. See our website for details. The Sunburst Award takes its name from the debut novel of the late Phyllis Gotlieb, one of the first published authors of contemporary Canadian speculative fiction. Past winners of the Sunburst Award include Charles de Lint, Cory Doctorow, last year’s winner Gemma Files, Hiromi Goto, Nalo Hopkinson, Guy Gavriel Kay, Thomas King, Charles de Lint, Ruth Ozeki, and Geoff Ryman.